The international break, originally started as a blunt instrument of medieval torture deployed by the British Empire to flatten the average football fan’s enthusiasm, is over. And we can all look forward to some real football now. Manchester United, who sit top of the table with 10 goals without a reply, go to the Bet365 Stadium with full of confidence. The same can’t be said about Stoke though, who have scored only 2 goals in three games so far, and have lost a lot of their last season’s regular goal scorers. The Potters have tried to change their playing style over the last couple of seasons that has some rival fans mockingly refer to them as Stokealona. They play a lot of their football on the floor now, as opposed to a volleyball match that we are used to witnessing at the Bet365 in the years gone by. With the arrival of Jesé, on loan from PSG, Stoke surprisingly boasted the most number of Champions League winners in the Premier League, five, at one point. That now has changed to four with the departure of Bojan to Alavés, and everything in the world is normal now. After a pretty dismal 2016/17, Mark Hughes spoke of cutting down the first-team squad, giving youth a chance, and generally making the team more appealing to their own fans, after months of being virtually unwatchable. Potters have found goals hard to come by. Stoke players scored 37 times in the Premier League last season. Take out those who have already departed this summer, and you are left with a measly 21 goals. Moreover, players who created 95 of Stoke’s 300 chances have also left the club during the transfer window. Mark Hughes has so far opted for a 3–4–2–1 system that see Stoke creating two blocks within the team, a defensive seven and an attacking three, with Joe Allen providing the support in attack through the middle, and wing-backs occasionally joining the attack from out-wide. They use three traditional stoppers in the center of defense, who have limited scope to attack. The job of their centre backs and midfield is to create a screen, and win the ball from the opponent, transitioning it quickly to the front three, whose job it is to create and finish chances. In the middle of the park, Darren Fletcher, a former Manchester United midfield engine, plays as a destructive midfielder, who is tasked to win the ball quickly. On the other hand, his midfield partner Joe Allen has more attacking freedom, joining the attack when possible, or spraying passes into the channels or through the middle to instigate the attack. With Mame Diouf being doubtful for the match due to knee injury, Stoke are most likely to field defensive wing-backs in Pieters and Cameron. 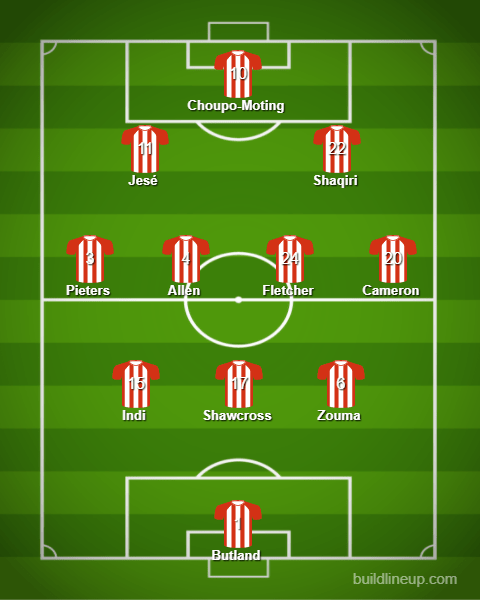 In attack, Stoke are likely to play the combination of Jesé, Shaqiri and Choupo-Moting that worked well against Arsenal, their sole victory so far in the campaign. United have had a flying start to the season, which has led to a lot of their fans getting carried away, claiming that they will conquer everything this season. Might I remind, United have had a similar start to the last season, winning all their games before the international break, and we all know how that ended. However, you could argue that the manner of this season’s victories has been impressive, and United look more menacing going forward. Which is true, but if you analyse the games closely, you would see that United have struggled to break teams down for long duration of the games this season as well, and it’s only towards the end that they have had a flurry of goals to make the score-line look more flattering. United are yet to beat Stoke under Jose Mourinho, and the longer it takes to score that first goal, the tougher it’s going to be to change that. United will most likely play the 4–2–3–1 system that has worked well so far in the campaign. With the arrival of Nemanja Matić, Mourinho has now got the balance that was perhaps missing with his preferred system last season. In their first three games, United have played a double pivot of Paul Pogba and Nemanja Matić in the midfield, with Matić sitting in front of the centre-backs, giving Pogba the licence to bomb forward whenever possible. Up front, in Romelu Lukaku, United have a striker who can hold up the ball as well as stretch oppositions defense, creating the space for midfielders to drift into, which will be crucial as Stoke are going to try their best to squeeze the space in front of their goal. 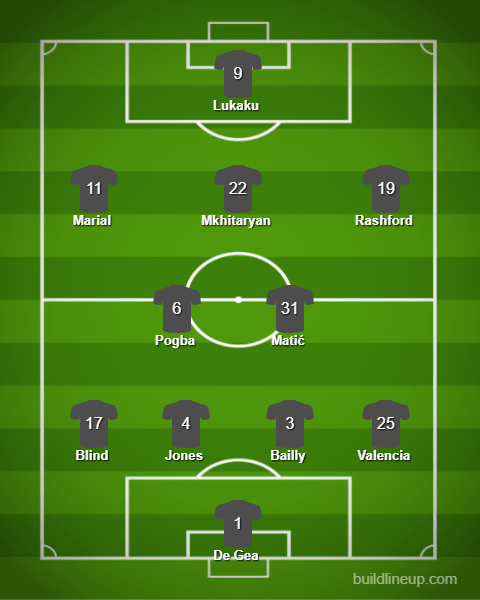 United’s three attacking-midfielders behind Lukaku will look to find space between the opposition’s midfield and defensive lines, while also cutting inside from the wing into half-spaces, with fullbacks providing the width. One of the ways to counter a 3–4–2–1 that Stoke is going to deploy is through width, and although Antonio Valencia provide the width on the right, United don’t have a natural wide player on the left. Add to that, Valencia is yet to discover his last season’s form, and with his tendency to take too much time on the ball to make decisions during the possession phase, United might struggle to create quick build-up plays down the right. The last team United faced that deployed a three-men defense were Swansea, and United struggled to break them down, scoring at the dying minutes of the first half. And even after taking the lead, there were lack of clear cut chances to score for United. It’s only when Swansea switched to a 4–4–2, trying to chase the game, United steamrolled past them with 3 goals in 3 minutes. So, it won’t be as easy for United as some might have you believe. 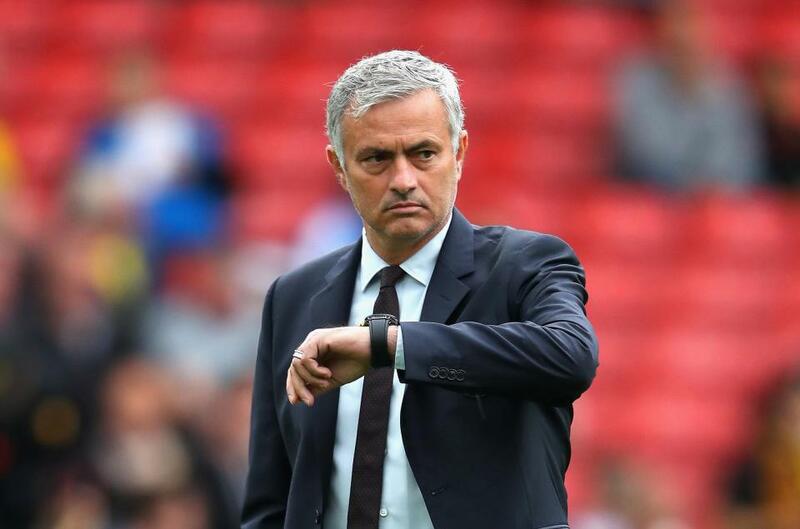 It’d be interesting to see if Mourinho match Stoke with three-men at the back, although it’s highly unlikely given how well United have played in the 4–2–3–1. Moreover, with 7 games to play this month, squad rotation and system changes will come later this month. So, I don’t expect Mourinho to make too many changes for this one. What I would expect is for him to bring in Rashford for Mata, who has been a passenger most of the time this season. Rashford will give more natural width on the right, and be full of confidence after scoring for three lions earlier this week. Apart from that, I expect the same line-up that started against Leicester. United haven’t beaten Stoke in their last four visits to the Bet365 Stadium. But this Stoke side isn’t the usual Stoke side that we are used to seeing over the years. I fully expect United to prove too strong for them in the end. I am going for a 2–0 United win. Rollover Saturday already! Interested in tactics from Root One to False 9 and everything in between. Likes people who do not use SMS language. Thanks a lot for posting it on the website with all the images! !